Ride your bike along the leafy streets of Eugene, all the way to the riverside paths of Alton Baker Park. Linger by the lake to feed the ducks, fill your lungs with fresh Oregon air and feel the stress of your busy week slip away. Watch football at Autzen Stadium and get carried away by the electric atmosphere at the nation’s loudest college stadium. After dark, meet friends for drinks at Jameson’s Bar, catch an indie movie at Bijou Art Cinemas or enjoy live music at McDonald Theatre. 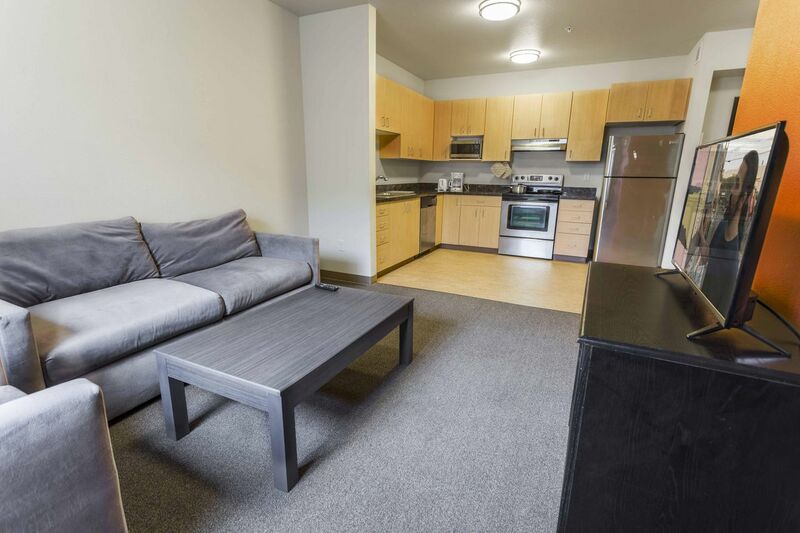 Living at Westgate, you’re a three-minute walk away from campus, and a seven-minute stroll from Downtown Eugene. Pedal to Alton Baker Park in 15 minutes, or jump in your car and drive out to the beach or the mountains; you can park your car or bike on-site. Make the most of sunny days and sit out with friends on the patio, or take your books to the spacious interior courtyard. When it gets too chilly to sit outside, get together in the social room, where you can watch your favorite shows on the huge HDTV, or clear your head with a workout in the fitness center. Back in your apartment, whip up your favorite food in your sleek, fully-equipped kitchen. When you don’t want to cook, you’re surrounded by restaurants and takeaways. Don’t forget The Dough Co. delivers amazing calzone and cookies until the early hours! 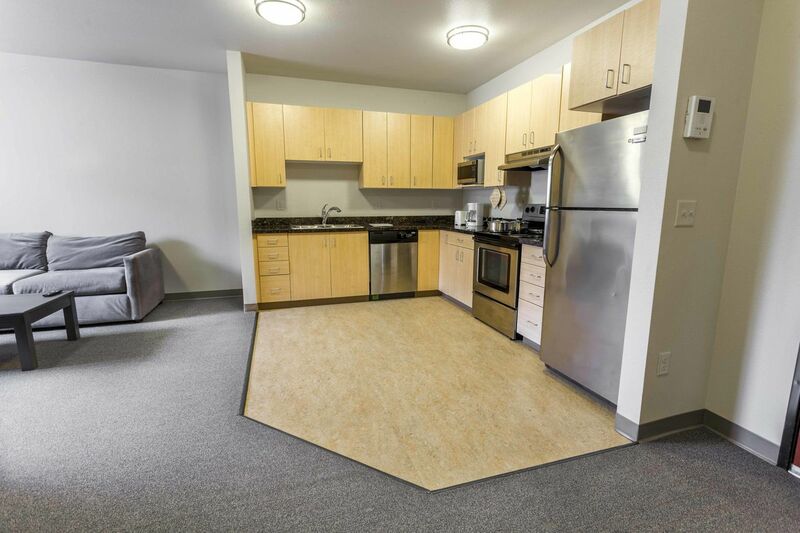 Eat in comfort in the spacious dining and living area, then watch TV with your roommates or head back to your private bedroom to catch up with your studies. The free Wi-Fi throughout the building will mean you’ll get your assignments done in no time. If you’re busy with a group project, you can work with friends in the study room. 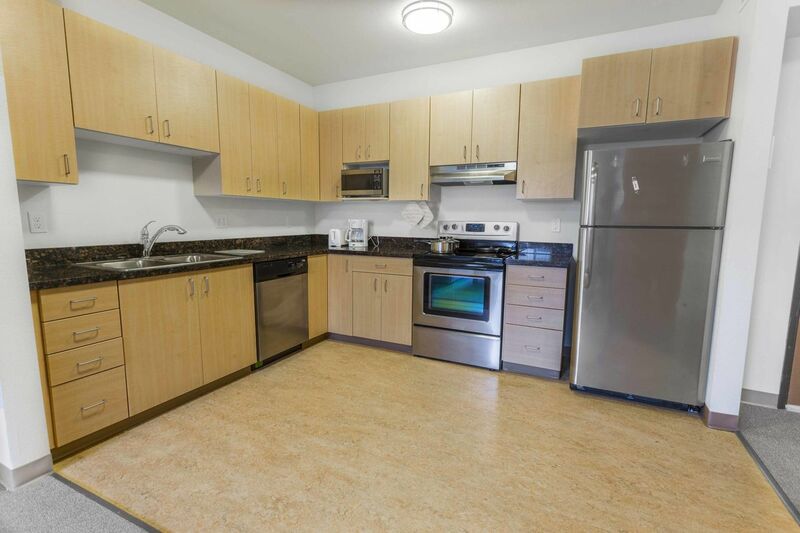 You won’t have to worry about running out of clean clothes because there’s a washer/dryer in your apartment, and the handy garbage disposal room helps to keep your home clean and tidy. The 24-hour maintenance team can help if you run into any problems, and security is a top priority. The video intercom, electronic access and video surveillance system will keep you safe and secure no matter how late you get back home. Wir haben leider keine Unterkunft gefunden, die deinen Wünschen entspricht.Alle Privatzimmer in The Westgate - Element Communities ansehen.